Buy a combo ticket and save ten bucks (but do it by midnight on March 8). Buy a combo ticket and save ten bucks (but do it by midnight on March 8, 2018). 2018 COMBO TICKET: The discounted tickets are on sale through midnight on Thursday, March 8, and you'll score a cool tenner off if you buy it, lickety-split, before the deal closes. What does a Combo Ticket do for you? You'll get into the festival, yep, and you'll also enjoy a Gourmet Alley Combo Plate. You'll want to use the code GARLIC40 at checkout, too. Why the "40" in the code? 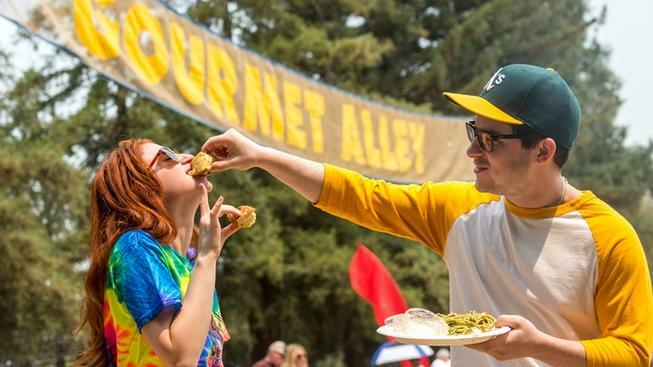 Glad you asked: It's the Gilroy Garlic Festival's 40th anniversary, which means a lot of garlic-obsessed eaters have been savoring a lot of spicy sublimeness over four foodful decades now. Jump into this deal, as fast as a clove sizzles in an olive oil-drizzled pan, and get your tasty deal to a fiery fest.